The AMPER Trade Fair 2014 promoters invite you to participace on the biggest professional event from the sectors of electrical engineering, electronics, automation, ICT, lighting and security which will take place at Brno Exhibition Centre from 18 to 21 March 2014. The AMPER Trade Fair brings to its exhibitors an ideal space for establishing new business relationships in the country of a strong industrial and human potential. The AMPER Trade Fair is the biggest international trade fair of Electrotechnics, Electronics, Automation, Communication, Lighting and Security Technologies in the Central and Eastern Europe. On more than 30 000 sq.m. of the exhibition space of Brno Exhibition Centre, which is one of the most important and the best functioning exhibition grounds in the Central Europe, you will meet more than 600 exhibitors from more than 20 countries in front of more than 40.000 professional visitors. The visitors to the AMPER are professionals, technicians, decision makers, businessmen, buyers and company managers. The Trade Fair will have a strong support by professional medias, associations and universities. During the event there will be organized many seminars, conferences and trainings related to the represented sectors. Traditional and inseparable part of the AMPER represents GOLDEN AMPER, a competition awarding the best and most beneficial exhibits registered at AMPER Trade Fair. 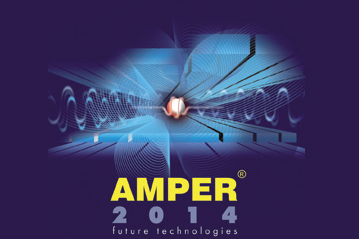 Another successful project of the event is AMPER MOTION – the electromobility show. The Editing team of the web portal Elektrika tv will continue with the live streaming on the media show AMPER FÓRUM 2014. On this platform the Elektrika tv will bring, in cooperation with the organizing company TERINVEST and editors from the respected journals, live discussions on current topics from the respective sectors, interviews about exhibits and services of the AMPER 2014, the show views through the eyes of visitors, students, exhibitors, journalists and organizers.